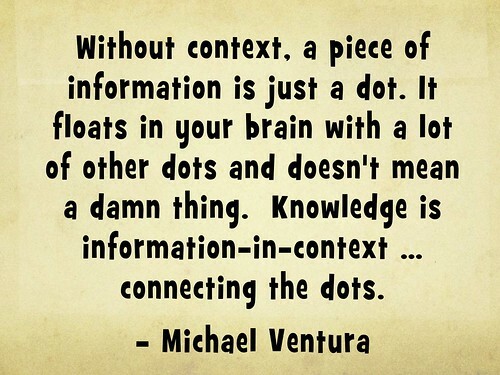 Connecting the dots – digital literacy and connected learning. What an exciting time to be involved in education! What a challenging time to be in education! What a busy time to be involved in education! Anybody who is involved in education is feeling all of these things – fight and flight is present in most staff meetings when it comes to working out the best way to address all of the implications of living in this digital age. The digital divide isn’t just a concept of socioeconomics or geography or generational it is present within each and every school and teachers are feeling the pressure. The concept of connected learning is more than just having the hardware and the apps. The tension for education is how do we integrate these tools of learning to enhance learning for all students in our care. We cannot assume that our students know how to use these tools effectively for their learning just because they have been born into an era where digital technologies are as much a part of everyday life as eating and sleeping. They have been immersed in a world of connection through digital technologies but just as we have to teach our students to be citizens in the face to face world, we also need to help them understand that values and ethics are just as important in the online world. We cannot assume they know the best information sources or the best way of communicating their resources. They demand more of us as teachers in that they expect to be connected, they expect to be collaborative. How do we meet their expectations by placing our own learning expectations for them upon them? The answer would seem to rest with the concept of digital literacy. So what is it to be digitally literate? Trilling & Fadel (2009) define digital literacy as a combination of information, media and ICT literacy skills (Chapter 4). Rheingold in his book, “NetSmart: How to Thrive Online” describes it as a combination of 5 literacies – “attention”, “crap detector”, “participation”, “collaboration”, and “network smarts.” Chase and Laufenberg (2011) view it as “a genre, a format and tool to be found within the domain of standard literacy, rather than a concept standing at odds” (p.535). So many definitions! No wonder teachers feel like they are like the hamster running on that wheel, they need clarity. The definition I have found most useful is that of Gilster (1997) cited by Bawden (2008), digital literacy is “an ability to understand and use information from a variety of digital sources and regard it as literacy in the digital age” (p.18). Chase and Laufenberg (2011) then would seem to agree with this more broad definition. I would agree with all of the definitions I have read and suggest that digital literacy is an umbrella term used to describe a combination of literacies that represent a variety of skills needed to be successful not just in the context of a classroom but in all areas of life both now in the present time and in the future. We use our digital literacy when we are participating in the online environment but as it is part of standard literacy practices and not separate, our students need to know that sometimes the information available digitally may not compare with the information available in printed formats. Our students still live in privileged times where both forms of information are accessible. This is where information seeking skills are required rather than information searching as they need to learn the difference between and to filter quality over quantity of information. Connectivism is also an important component of digital literacy as it doesn’t just refer to the physical connecting to the network known as the Internet. It is the ability our students have to connect with like-minded people, to access information quickly to build upon their already established knowledge base. This idea of connectivism has so many strengths for education and it is fraught with so many ‘dangers’ as well. by ‘dangers’ I mean students need to have the critical thinking skills of digital literacy that will enable them to evaluate credibility and validity of information. This is a vital role of teacher librarians within schools as well because some teachers allow students to research without any guidance or feedback to the students’ processes used in gaining information. Connectivism is not just about student learning it is also about teachers’ depth of understanding of the information environment using digital technologies. The challenge is helping our students know their purpose and placing it in context and ensuring that the context is credible and relevant to their learning. Siemens (2004) describes the theory of connectivism as the way “people, organisations and/or technology can collaboratively construct knowledge” through “the integration of principles explored by chaos, network, and complexity and self-organization theories”(Starkey, 2011, p.21). Connectivism is the building of knowledge in a social and collaborative way. This highlights the importance of teachers needing to immerse themselves within the chaos of the knowledge network to increase their own digital literacy skills and to form their own connections with other ‘experts’. Teachers are no longer the only experts in their students lives and the students know this. Formulating Personal Learning Networks (PLN’s) online as well as offline is a necessary part of every teacher’s professional development and we also need to assist our students in creating their own learning networks. Our students current learning networks are social media and gaming sites. We need to guide our students to using their critical thinking skills to filter and seek people that truly represent valid and credible learning within their PLN’s. We need to try to find the way to harness these platforms to engage our students in learning. Downes, J. M., & Bishop, P. (2012). Educators engage digital natives and learn from their experiences with technology. Middle School Journal, 43(5), 6–15. « Towards a more socially inclusive classroom using Gee’s viewpoint. I really enjoyed reading your post – I had no idea there were so many notions of ‘digital literacy’ before starting this course – so it was good to see someone who has organised their thoughts so well! More recently I’ve been thinking about the notion of digital literacy in terms of a ‘digital mindset’ – understanding the thinking or mindset of a ‘digital person’ (as well as being able to use the tools, or be able to work out how to use the tools). If we’re not giving our students opportunities to do that then we’re setting them up for failure. I don’t see this as anything new as such – when I was teaching literacy to adults it was the same task – tuning students into a particular discourse so they could deeply engage in it – in the same way that I could (as a ‘literate person’ – and in this case, a ‘digital person’. I think The Open University digital and information framework (given to us in 3.2) provides a good breakdown of how digital literacy covers a spectrum of abilities – I’ll be interested to see what my colleagues make of it. As you note, assumptions are dangerous in this space. I’ve just finished reading Beetham and Oliver’s paper ‘The Changing Practices of Knowledge and Learning’ and was again reminded of the different ways our learners engage with technology, as they state “… only a small number of students are ‘agile’ adopters of technology – exploring new applications and features and personalising devices to suit their needs.” (p.162). I see this in my home life too, living in a house with a 16 year old and a 12 year old – they have completely different ways of engaging with technology – for the past two years I’ve watched the 16 year old connecting with experts (they really are!) all around the world to get input into the work he’s doing; the 12 year old is connected in a different sense, much more social. And the ‘old folk’ like me who, I’m now beginning to realise have their own contributions to make in this space. So, yes, you’re right. A challenging, exciting, busy time to be in education! Thanks again. Thanks for taking the time to comment. Makes it all seem a bit more worthwhile. I think the broader the definition the more flexible it is. The umbrella term definitely suits me as the tools/ software and apps continue to advance there will be more aspects to literacy…it is indeed multifaceted. Yet, we still need to realise, the traditional literacy of reading and writing is still as important today as ever to be able to work in this area of digital literacy. I see it with our K-2 students…there needs to be a level of comprehension to understand, compose, create and respond. I get what you mean about different generations engaging differently too.